Caution: Ledge ahead. Twin Daggers beware. 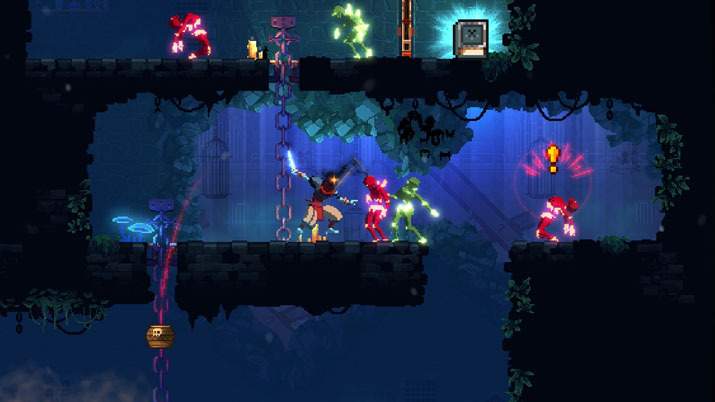 Dead Cells is a roguevania-styled title reminiscent of classics such as Castlevania: Symphony of the Night and any other 2D side-scroller RPG within the series or similar. I have searched sporadically for years for an RPG to resurrect the style of a classic Castlevania title. A couple of recent releases might come close — Rogue Legacy and Ori and the Blind Forest come to mind — but then comes Dead Cells. It’s what I’ve sought all this time; even the doors found here spark memories of the days of playing those classics. This game takes that side-scroller concept and melds it with a more rogue-like experience, featuring procedurally-generated dungeons, and penalties for death. But, at least currently, enemies do not scale the more upgrades you obtain, as they would in Rogue Legacy. A controller is optimal, but you might play this without too much discomfort with a standard keyboard and mouse, although performing jumps (spacebar) and rolls (shift) can pose challenges. Death may come quickly if you are not careful: the range of some enemies demands that you match them in agility in both your offensive and defensive measures. Perhaps my greatest obstacle was a lack of familiarity with a particular opponent or region. Each time you complete an area and move on to the next, you’ll meet the Collector, to whom you can give cells (gained by defeating enemies) in exchange for permanent upgrades, such as a health flask you can use at any time, an additional charge for this flask, and weaponry. One upgrade can modify your starting bow to be one chosen randomly from those you’ve unlocked from blueprints. Any blueprints that you’ve found, you can also give to this Collector; after investing so many cells into the blueprints you find, that particular piece of equipment becomes available to find during a run. Although, when you first unlock something from a blueprint, the item will appear, thereby allowing you to equip it immediately. You may further invest cells into a particular weapon to upgrade its damage. Upon dying, you lose any cells and blueprints you have in your inventory during a run not given to the Collector. Sometimes you find yourself rushing through an area if you haven’t had a decent run, just to ensure the safety of these cells and blueprints. Besides these upgrades, runes are likewise permanent (you obtain them from defeating an elite enemy). Runes assist you in reaching certain areas. The maps are a bit open in their design, and reaching various parts can be challenging. Not a fan of The Old Sewers? I’m certainly not, with random traps that appear out of nowhere (but trying to avoid these became fun at a certain point), so I often opt for The Toxic Sewers, or The Ramparts, instead. I’ll admit, the first time exploring The Ramparts, I did hear a slight l’appel du vide— I thought there was some secret area beneath the ledge of the buildings. Guess not. But, at least this trap isn’t (currently, at least) fatal; I haven’t encountered one that was fatal, regardless of current health. At no point did I not enjoy this title, even when I died. At no point did I feel as if my death was from some rigged layout; rather, whenever my technique was sloppy or rushed, I began finding myself in trouble. Discovering a technique for the quick elimination of an enemy is key; finding multiple enemies of different types conglomerating in a small area always poses a challenge. And, since these maps are procedurally-generated, you are not afforded the opportunity to remember a map’s layout. However, if you find yourself at a disadvantage or encounter an elite that you may not beat, sometimes the most prudent action is to run. Unfortunately, the save file wiped twice in two days. What is strange, though, is that not all of my progression was lost the second time. All of my upgrades and the blueprints that I found were, along with my rune, still present, but the opening dialogue did not cue as it otherwise would on a brand new file. Moreover, I recall the Continue option available at the Main Menu, as if I had a file already. Since Dead Cells is still in beta-phase, I assume that this will not be an issue come release day (at which point it shall be in Early Access phase). I hope it won’t — this is a fantastic title. Of course, this could simply be part of the development phase before release; this is a likely cause, given that someone in the discussion forums for Dead Cells wonders whether or not there will be another progress reset prior to release. Another issue was that when I unlocked something from the Collector from a blueprint, an error message occurred and the application window consequently closed. My progress of this particular run was not lost, however; I started off right before encountering the Collector. 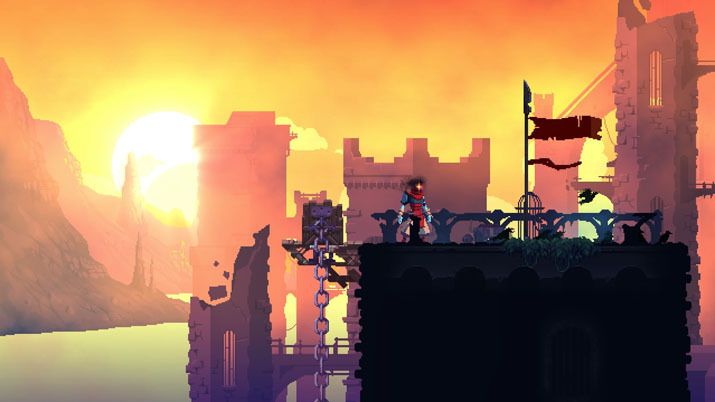 Dead Cells is not only for those who yearn for a Castlevania-esque side-scroller (nor would I want nostalgia to be the only reason to advocate a release [EN: Sounds familiar. ]), but also for any who love rogue-lites or side-scrollers with RPG elements. Dead Cells holds its own; it’s great, and it’s certainly promising with the content already offered. The developers have plans to introduce even more content down the line after release, such as more levels, bosses, and a stats feature. Although there are some hiccups in its current state, it’s dubious that these could become issues down the line, given how active the developers are — I had to update the game twice in a day. The difficulty, combined with the upgrade system, makes this release a solid choice for both the most experienced and novice players alike. You ought to buy it now, to avoid the inevitable price hike.